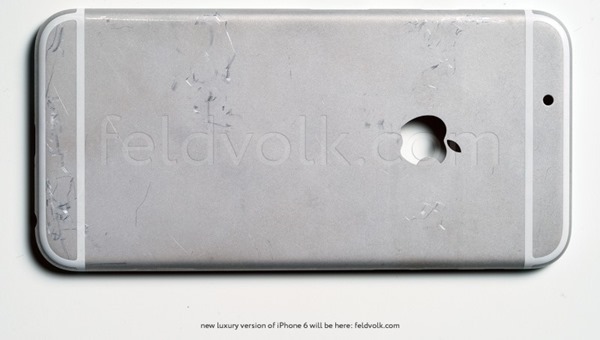 Even though, for quite a while, we’ve had a pretty solid idea of what’s in store for the iPhone 6, we’re now starting to encounter some solid evidence through numerous component leaks, and today, we’ve been treated to a close-up look at the rear shell of the 4.7-inch model of Apple’s upcoming handset. As well as a few high-quality images, there’s also a video to accompany this latest discovery, and below, you can catch all of the details. 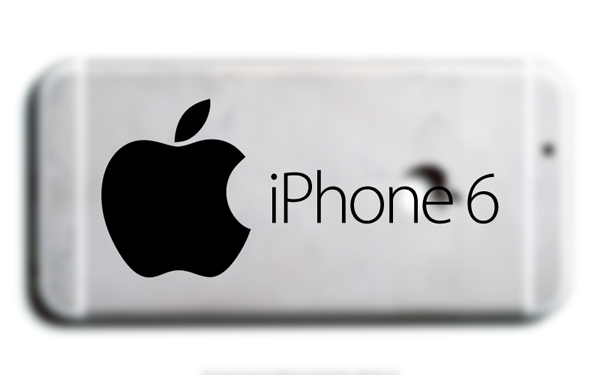 The umpteen iPhone 6 mock-ups that we’ve been seeing on a weekly basis can only tell us so much, and it’s only with these more detailed leaks that we can begin to fathom precise information regarding this very eagerly-anticipated device. 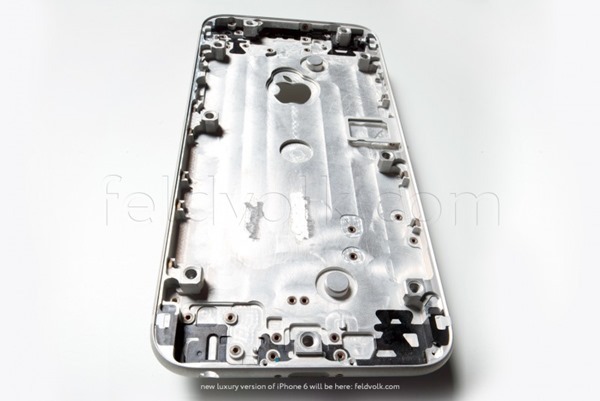 As per a report over at MacRumors, which has been sent in a number of snaps claimed to be of the next iPhone’s rear shell, it would seem that while Apple is looking to depart from the appearance of the iPhone 5s for the most part, the lauded metallic finish remains key to the iPhone 6’s overall design. In fact, these new shots suggest that there’ll be even more metal the next time around, and given how we tend to use the term “metallic” synonymously with “high-end,” I shouldn’t think too many would end up complaining about this. The view from the bottom of the device shows the Lightning port and speaker holes, and although this is to be expected, it’s immediately clear that these parts are not yet complete. 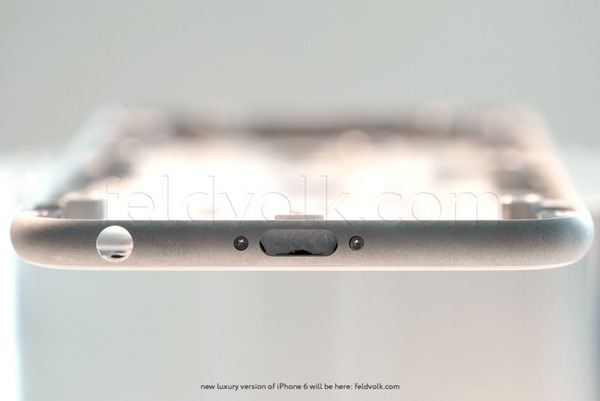 The camera bits and pieces, for example, have yet to be drilled out, but notably, the Apple logo has been. Although we’re not sure if Apple will introduce a new color option this time around, but from the last photo (above), you can see that the shell is being shown off in a new, dark gray color option. Wishfully, many have speculated that the iPhone may include a lit-up Apple logo akin to the MacBook range, but while this iconic feature would be incredibly cool, I’m sure many iPhone fans would rather have such a fanciful feature omitted in return for keeping the handset running for longer. As such, it’s likely that Apple simply plans to embed some kind of material into the Apple-shaped hole, although by the same token, we wouldn’t completely disregard the idea of a glowing logo. Feld & Volk, the original source of the images, suggests that the device may include NFC, and with a September announcement date still floating around the blogosphere, we won’t have to wait too long for the big unveil. 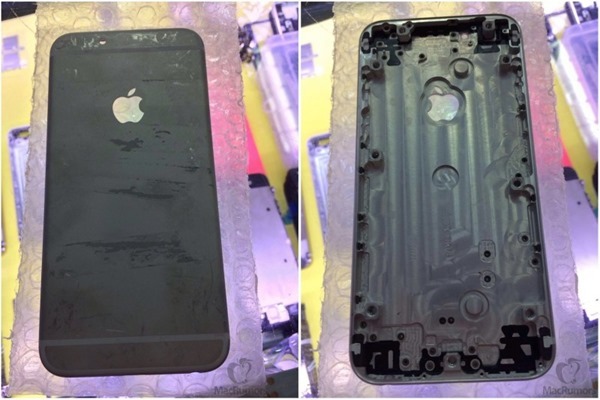 Check out the video of this new part leak below, and as ever, do share your comments with us.